The presentation of this CD could be better. Mr. Burrell’s essay is squeezed onto a single page, the text printed right to the edge. Its unstinting laudatory tone does no service to an emerging composer, especially when useful factual information such as when the pieces were composed, is omitted. Texts are included, but those of the two works sung in Latin are given only in English. Individual timings of each work are not given. The recording is fine. Paul Mealor was appointed Principal Conductor of the Con Anima Chamber Choir in 2008, so although no conductor is named here we can safely assume it is he. As a conductor of amateur choirs myself, I can confidently state that most of my colleagues, and not a few young composers, will be rather jealous that he has this particular choir at his disposal. They make a truly beautiful sound with only the occasional trace of harshness in the women’s voices. Balance and blend are very good and there are some excellent men. There are difficult moments in some of the music on this disc - soprano lines can be punishingly high, for example - and tuning is not always faultless. Attack can lack unanimity too, especially when a phrase begins with a difficult chord. It’s perhaps unfair to cite individual soloists, but I do salute the soprano Jillian Bain Christie, credited with the solo part in Let Fall the Windows of Mine Eyes. There is a certain fragility about some of the other soloists drawn from the ranks. I usually like to make a new composer’s acquaintance by listening to the works in chronological order of composition. Having no dates to help me in this case I decided instead to listen to the shorter works first, leaving the Stabat Mater until last. Mealor evidently has a liking for linked structures, with the separate pieces that make up most of these works linked by what he calls an “aural thread”, usually wordless, held notes. His harmonic and melodic language is almost exclusively tonal. Deep, sonorous bass parts occur frequently enough to risk becoming a mannerism. Listening to these works a picture gradually emerged of a composer close in spirit to others such as Javier Busto and Vytautas Miškinis. These figures are very active in the world of amateur choral singing: many of them are conductors themselves and they frequently judge choral competitions. Their compositions are tailor-made for amateur singers, often gorgeous in sound, always grateful to sing and, crucially, quite evidently contemporary in style without alienating those who sing them. Another composer whose name came to mind was Morten Lauridsen; interestingly, the choir’s website carries a photograph of him with the group. Paul Mealor’s music is less chromatic than that of any of these composers; less chromatic than that of Howells or even Vaughan Williams. In its strong attachment to tonality one might think of Pärt or Górecki - two composers cited on the back of the cover - though only at one point was I strongly reminded of one of these. I did eventually come up with the name of another composer to whose music that of Paul Mealor could be compared, and that in the work where I should have least expected it. To turn to the works themselves, the short unaccompanied motet Beata es, Virgo Maria is a quietly reflective piece which immediately establishes its composer as one with a keen ear for choral texture. It’s a lovely piece, richly scored, but after three or four hearings I don’t think it has much left to tell. I was less immediately taken by Lux Benigna, a setting of a poem by Gordon Graham which explores the relationship between light and the divine. Each of the three verses of this work for upper voices and piano receives more or less the same musical treatment, and a cadence in the “wrong” key seems to be the only nod in the direction of chromaticism. Moments here and there reminded me of Holst’s Choral Hymns from the Rig Veda, but the comparison is cruel: Holst’s piece immediately creates its own world in a way that Mealor’s piece cannot be said to do. Let Fall the Windows of Mine Eyes is an unaccompanied setting of three short texts from Shakespeare exploring the theme of loss. They create a powerful mood of sadness, but the composer has set himself a huge challenge in trying to find music to complement such imagery as that contained in the work’s title, for example. By the time I arrived at this piece I realised I was struggling to get a grip on the composer’s musical identity. Strict adherence to tonality is only part of the problem: the music of John Tavener or Arvo Pärt is easily recognisable within an equally tonal framework. Perhaps one shouldn’t worry too much about this. What’s more important is that the composer has matched the mood of the words here, and that mood does linger in the mind long after the final notes. Settings for soprano and piano of three poems by Emily Dickinson make up Between Eternity and Time. The poems, if they can be said to be about anything, are about love, but Dickinson’s work is so oblique and inward that the notes required to sing them are very elusive. Copland succeeded brilliantly, but who else? The third song, strikingly melodic, demonstrates nonetheless a kind of rapture that I find at odds with the nature of the verse. At the end of this song Mealor has the singer repeat the first line followed by the line from the second song which gives the work its title. He uses a similar device in the Shakespeare settings, a clever and original way of providing unity within the work. I think the composer will be very happy with the performance from Irene Drummond and Drew Tulloch. Another strikingly original idea is to set the three texts Ave verum corpus, Ave maris stella and Ave Maria for unaccompanied choir, and to link them - the “aural thread” again - to make a single, unbroken span entitled Ave. Sadly though, I found it difficult to engage with this piece. Javier Busto’s Ave Maria is only a third as long as Mealor’s, but how much more there is in it! I was virtually begging the composer to change key during this six-minute setting! The text of the Stabat Mater, the lamentation of the mother of God at the foot of the Cross, is a harrowing one. Paul Mealor’s setting caused Carter Joel Burrell to weep “tears of joy from beginning to end.” In his booklet essay he refers to the “heart-wrenching opening chords” as well as to the “wonderfully intense conclusion”. These opening chords are extremely, strikingly beautiful, but so many suspensions and piled-up thirds tend to communicate serene contemplation rather than the anguish of Christ’s mother. The sopranos are challenged once or twice in this opening passage, which is unaccompanied, the piano entering, in unison with the choir, for the first notes of the second section: near-unlimited terror for the conductor! This was the moment, too, which strongly reminded me of a passage in Górecki’s Symphony of Sorrowful Songs. Constant semiquaver movement in the accompaniment is an important feature of the third section, and the fourth sees a return of the opening music. Bearing in mind the nature of the text, I found this setting over-sweet, even sentimental. There is a richness of harmony and texture which is alien to the words, and the final reprise of what I struggle not to call the big tune follows a piano build-up worthy of Andrew Lloyd Webber. 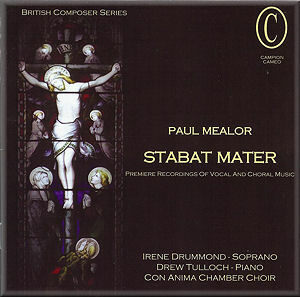 Rich, beautiful and instantly memorable, I’m not surprised to read the almost ecstatic praise heaped upon Paul Mealor’s music by some commentators. I am sure it will appeal to many who read this. But it’s not for me, I’m afraid.